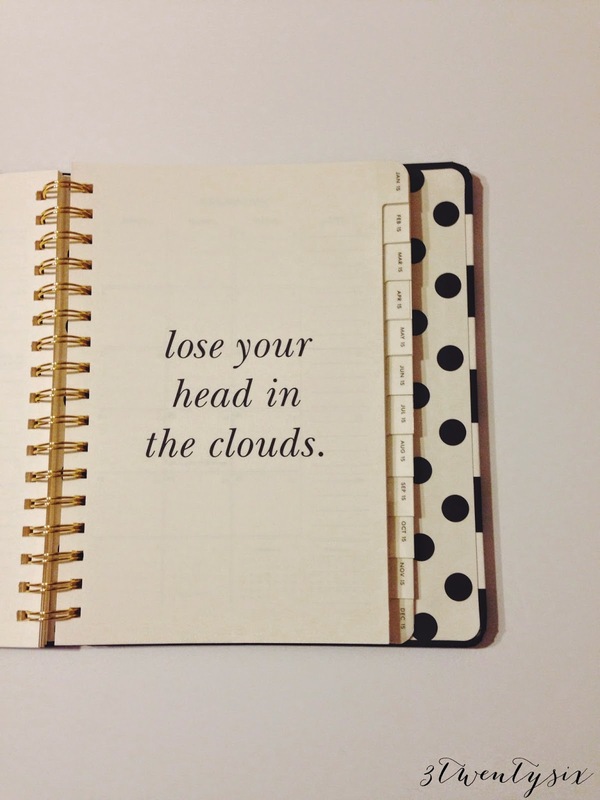 3twentysix: Kate Spade 2015 Planner | Eek!! 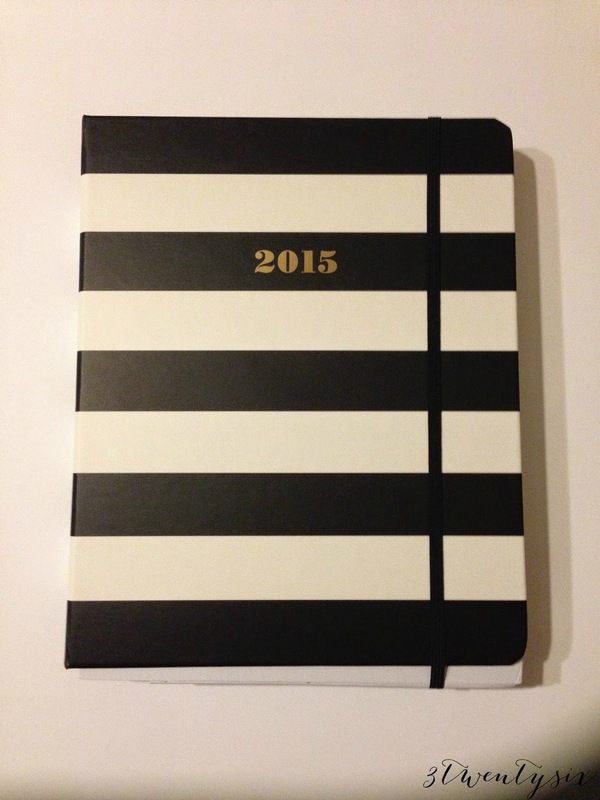 Kate Spade 2015 Planner | Eek!! If you don't already know, I heart Kate Spade and all of her goodies. At the beginning of this year, I went on a search for a Kate Spade planner. Bre from Brewrites.com posted a picture of her planner on Instagram and my mission to find one began. Unfortunately, I was not able to find any because everyone and their dog bought one. :( I let it go and found me another planner that I wasn't too happy about, but it got the job done. Tracy from TracyXO.com posted on her Instagram that she ordered next years KS planner (thanks for the reminder) & my mission began alllll over again. This time I found it! I silently screamed (is that even possible?) at my work desk when I put the order in. I received this beauty yesterday and OMG it truly is everything. The only thing I'm a little iffy about is the size. It's massive at 9" in height and 7" wide. KS decided to do two sizes this time, the smaller one measures at 7.75" in height and 5.5" wide so it's definitely something to keep in mind if you'll be buying one. Yesterday when E came home from work I was hugging the planner in a crazy kind of way LOL! He laughed and said "You're not excited are ya?!" LOL! I am completely stoked with this new planner and can't wait to start using it. I need to figure out if I want to keep this size or if the smaller one will be better for me. 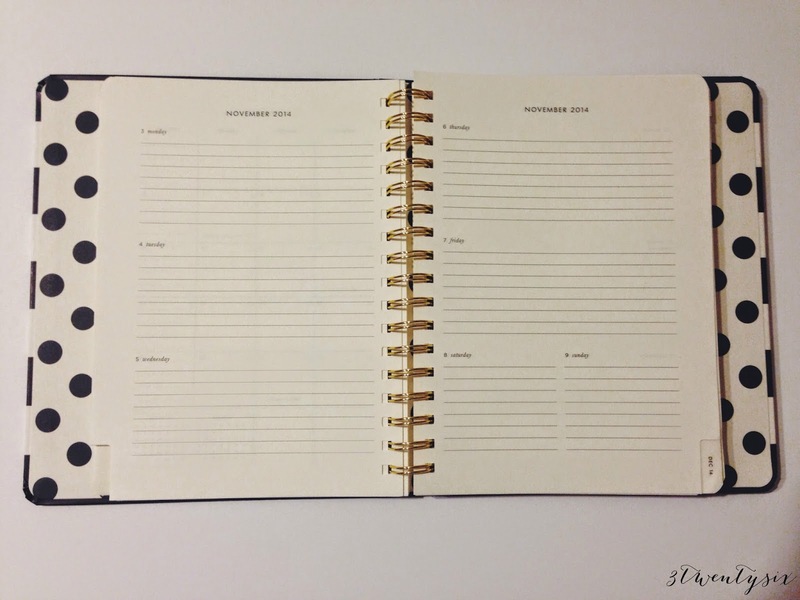 This big planner isn't one you can stick in any purse, it's pretty bulky so that smaller one might benefit me a bit more. Here's a little more about the planner (big & little).. 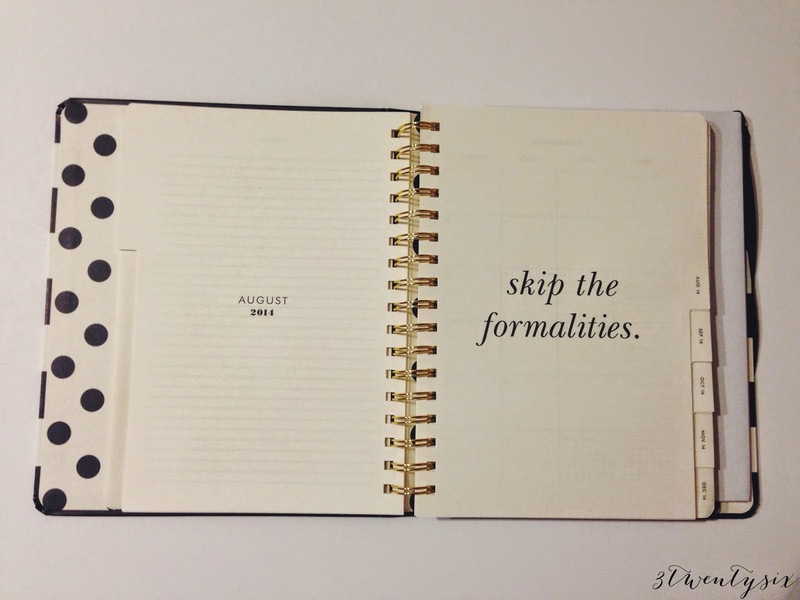 It's a 17 month planner that starts August 2014 and runs all the way till December 2015. 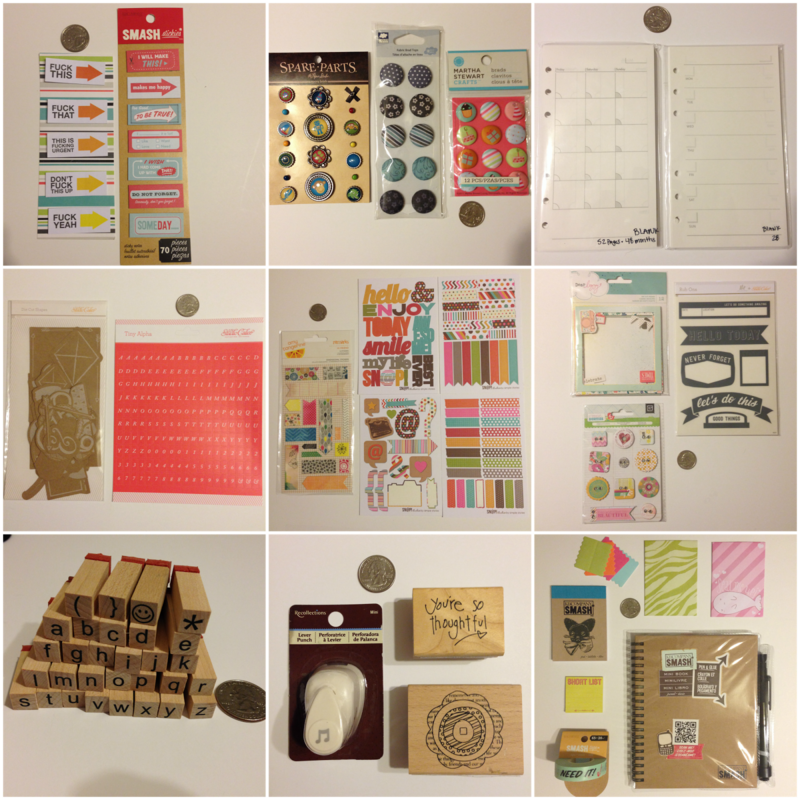 It has laminated tabs, monthly and weekly spreads (gasp!) and includes a contact and notes page. The elastic closure gives it a completed look and keeps your goodies safe. 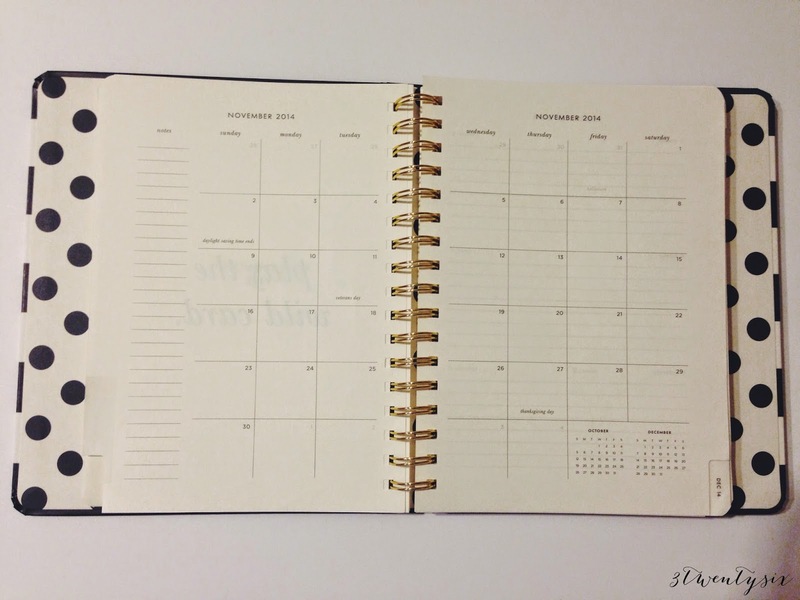 It has a hard cover that allows the planner to lay flat which is a huge deal to me. I don't want to be fighting the planner in order to write that I need to pick up laundry detergent haha! Last thing I really like that I didn't think was a big deal before, the gold stained spiral that holds it all together! I know, I'm such a weirdo but it really makes a difference. There are four unique designs for both small and large planners. The black one I bought and the gold dotted one were available last year too I think. In case you are wondering where you can find one, I bought mine from Swoozies.com. It has nothing to do with KS but it was one of the few online stores that had it available now. I tried Nordstrom, but they don't have it in stock yet and I couldn't take the chance of buying it and then finding out that it was sold out. That's what happened to me earlier this year with the 2014 planner :( I don't think KS has it available on their site yet, I'm sure it'll be there soon though. If this is a planner you're interested in buying, hurry and hit up Swoozies or another online store asap before it's sold out! Weekend Snapshots | Summer is here!